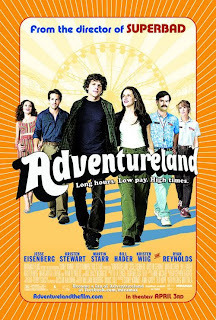 I just caught a movie that I have been intending to see for a while, Adventureland. To sum up how I liked this movie I can only say that it made me happy. Why happy? We all like to reminisce about our formative days of youth and first love and this movie does an admiral delivering those memories. Be it party, angst, sorority hijinks or slasher movies the teen demographic is well represented. What is really rare however are movies targeted at teen that forces them out of their box and makes them think or for us older folks reflect. This one tackles the awkwardness of those first crush moments and the crush of dreams and birth of new ones. In Adventureland, Greg Mottola (director of the also fine Superbad) steers away from his typical laughs and goes for that little part of us tucked away in the memories of vulnerability in our quest for love and adulthood. By bringing up these repressed memories, he reminds us that it wasn’t so bad back then and in fact we can look back at those times and long for those days where we had an abundance of time, meaningful live changing friendships, mind numbing jobs for no pay and for some reason worried about getting out of there and getting to where we are now. Adventureland’s strength is the acting and particularly the acting from the two leads. The characters here are smart, cerebral and flawed. This makes them real and otehrwise likable. Kristen Stewart (Twilight, New Moon) proves that she is miles better with a good script, and a lot prettier without the vampire sympathizing make-up that makes her so pale. Jesse Eisenberg (Zombieland) returns to the amusement park setting and delivers another fine portrayal of an intelligent kid that borders on geek but proves to be cool with how he handles his challenges. The story is a realistic tale of college bound teens struggling with middle class parents, saving money for college in dead end summer jobs and the coming of age into their own adulthood and the difficulty of navigating its relationships. To be spoiler free, I can’t discuss the results of these relations, but I can recommend this film.